Vaporum is a modern day dungeon crawler that mixes beautiful visuals with that of grid-based combat. The left analog stick controls your basic front, back, and side movement, the right analog stick controls where you’re looking. The movement, however, is based along a grid, so you won’t be moving freely, but instead within a row that is either up, down, left, or right. This can be challenging for new players as it is something different, but it’s very easy to get used to. The one area I had a slight issue with was how fast the camera moved. At times it felt uncontrollable, as it moves on a grid system as well. You wake up in front of a giant tower in the middle of the ocean, having no idea where you are or what you’re doing. You’ll get an exo suit that is your main source of health and protection along with various weapons to use to defend yourself. There are some unique puzzles that you’ll have to solve in order to advance further into the tower. Besides normal weapons like crowbars, swords, daggers, and guns, you’ll also get gadgets that can be equipped to your suit that can be used in combat. Using the gadgets will drain the energy meter, which does refill slowly over time, so when upgrading, increasing the maximum amount of energy you get along with how fast it regenerates is a must as the gadgets can be very useful. Speaking of leveling up, in order to level up instead of collecting XP, you’ll get fumium. After destroying enemies, you get small amounts, exactly like you would with XP, once your suit collects enough, it’s time to level up. When leveling up, the suit automatically gets more powerful, but you will also get circuit points. Circuit points are used to level up the circuits within suit which are the different abilities you get, including overall health, energy meter, and the likes. You’ll get a handful of options to put the circuit points into, such as dual wielding, blocking, etc. You can click the tooltip button on each to find out what purpose they serve, as well as to see if it’s right for the play style you’re using. Vaporum has a lot of cool concepts and ideas that work wonderfully with what it’s trying to accomplish. A few minor issues with the controls weren’t enough to stop me from enjoying my experience and I definitely look forward to multiple playthroughs using different styles and techniques. 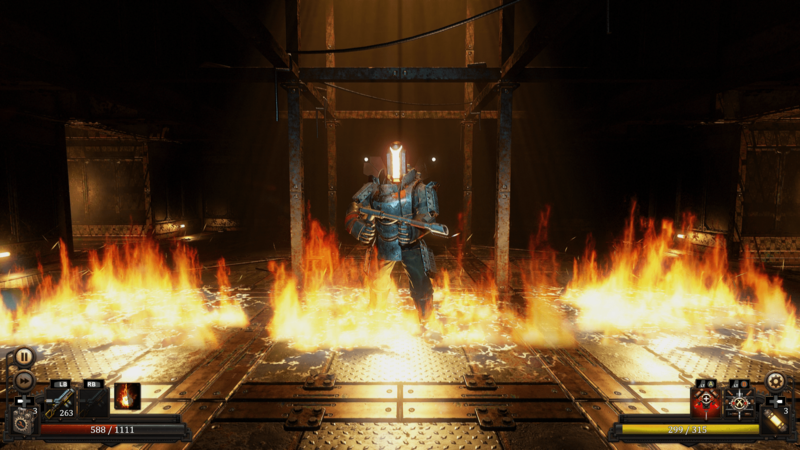 Vaporum is a first-person steampunk Grid RPG that shouldn’t be missed by fans of the genre nor newcomers.